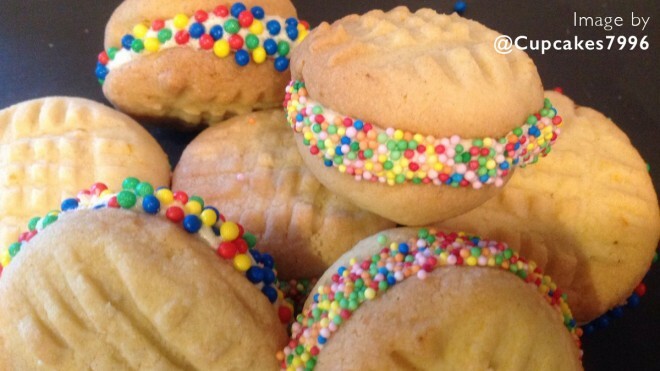 An easy yet colourful sandwich biscuit recipe, make them as decorative as you choose. Pre-heat the oven to 150°C (fan)/325°F/gas mark 3. Place the butter and icing sugar into a bowl and beat until pale. Add the plain flour, cornflour and orange zest. Rub in using your fingertips until the mix resembles breadcrumbs. Work to bring the mix together as a dough. Line 2 baking trays with baking paper. On a lightly floured work surface roll the dough into a sausage shape. Divide the dough equally into 24 pieces. Roll each piece into a ball. Evenly space the balls on the baking trays and flatten each ball using a fork. Bake for 18-20 minutes or until just golden around the edges. Allow to cool before placing onto a cooling rack to cool completely. Place the butter, icing sugar and orange zest into a bowl. Beat until smooth. Spoon one teaspoon of buttercream onto the flat side of 12 biscuits. Top with the remaining 12 biscuits to make a sandwich, press together lightly to squeeze the buttercream to the edges. Dip the buttercream edges of each yoyo into your sprinkle pot to decorate.